Here I helped Dumitru Langham BSC conduct an interview for ADHD Solutions in Leicester. It took two days to film. Demitru set up appointments to film a wide range of people in various age groups that are diagnosed with attention deficit hyperactivity disorder. The first day Joey Lever and I had set up the 3 point lighting using redheads, 1 profiling key light which was diffused and 2 fill lights. Demitru was filming the interviews, Joey was on audio, and I was documenting everything. The second day Demitru was filming again while I was on audio with the zoom microphone, and also documenting everything. Demitru and I had set up the lights this time only using two flolights that were both diffused. 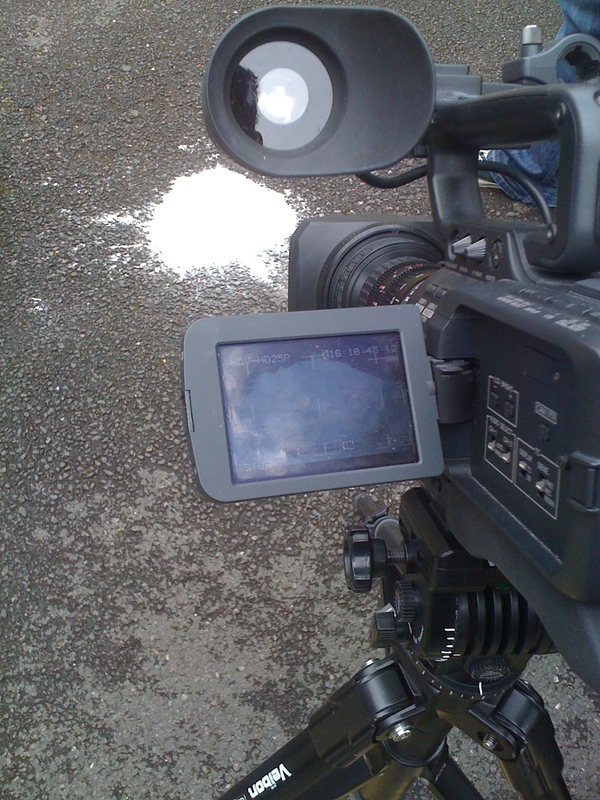 Above is the footage that I recored documenting the interview as well as the procedure of the production. None of the audio from the zoom mic was used in this video. I edited in Adobe Premier Pro and used copyright free music called Aretes produced by Kevin Macleod. 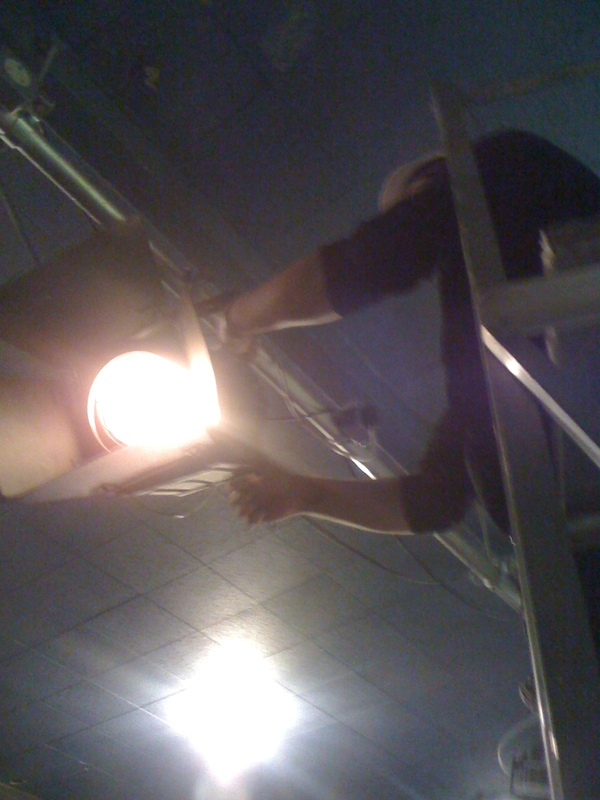 Below is a picture of me setting up the one of the redhead lights on day one (photo credit to Joey Lever). 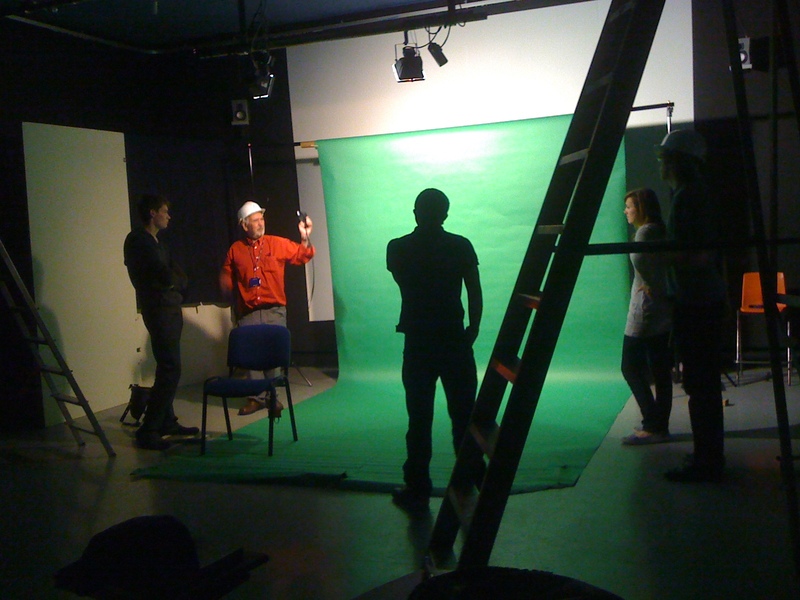 Below is my class doing a green screen exercise with our lecturer Jon Holmes. The completed video is supposed to go on the BMC colleges media website. It shows my fellow classmate Craig Ellis pretending to look out of a window which is actually a green screen which we add in video and chroma key later. For this task we used 5 point lighting to properly light our green screen and our subject. We used two flolights with the three point lighting kit ( two 300 watt lamps, and one 650 watt lamp) we diffused these and also put a blue gel on them to match our flolights so everything was consistent. The flolights light the green screen while the 3 point lighting kit light the subject from the side, behind, and the other side. We used the jib and attached it to our track so we can have a nice dolly motion. We put mic stands on the right side of the frame and 3 markers on the green screen to establish depth in the shot. We will get rid of this by creating a mask over them and then deleting them from view in Adobe After Effects. The video was all shot on Canon 7D and will be edited in Adobe Premier Pro. For this task Brad Raiser, Frankie Burrows, and myself had to install and light the green screen correctly. We came up with a lighting plan to successfully get a well-lit green screen. First we had to locate and set up the green screen, all while taking safety precautions. Once we had the green screen up we looked at our lighting plan and got to it. 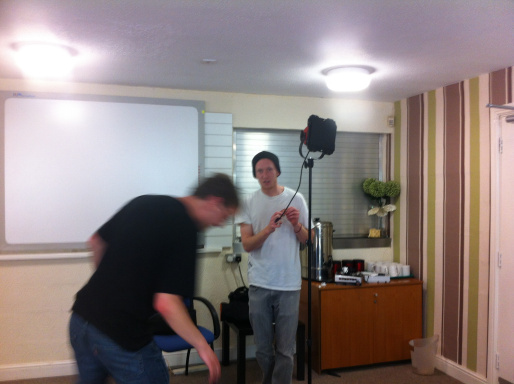 We decided on the portable lighting kit which comprised of two 300 watt lamps, and one 650 watt lamp. The two 300 watt lamps were positioned on either side of the subject (me) and their main purposes were to light the green screen. The 650 watt lamp was aimed to light the subject and ended up being exceedingly bright so we diffused this to soften it. We encountered a problem from the 650 watt lamp, it casted unwanted shadows on the subject. We corrected this by adding a 500 watt flood light on the lighting bar to counter the shadows. We then thought this lighting was sufficient to shoot and capture footage but we still had to check. We set up the JVC camera on the tripod to try and hook it up to my Macbook laptop. We wanted to use video scopes in Final Cut Pro to see if we had lit the green screen properly and had an accurate light reading. Since my Macbook is an older model from 2007 it takes a 6 pin firewire, so we ran into a problem to locate the 6 pin to 6 pin firewire. Since we couldn’t obtain this cable we had to make do, and find another way to measure this ambient light. We decided to use the light meter instead, and we had an average overall reading of 3.4, which we were happy with. We then filmed myself on the green screen not really doing anything in particular. I just moved a bit to show that the green screen had been properly keyed. I’ll admit that our lighting wasn’t perfect. If I could make one suggestion it would be to add a light (such as a parcan) behind the subject to light the back to make it so the light sources come from every angle. This all and all was a good learning experience for me and my group. Below is a picture of my instructor, Tony, and his lesson on ideal lighting plans for green screen, as well as our own groups lighting plan that we used. Here our HND Media class did an exercise mock interview for a talk show. Vicky Grant, Garreth Skinner, and Pete Bendoris were our subjects for this demonstration. All of them set up the white curtain background for this interview as well as get comfy chairs and flowers for the table to add effect. Bradley Raiser is shown on the ladder correctly adjusting our lighting for this task. He is wearing thick gloves to avoid burning himself on the hot light while Sam Shannon is stabilizing the ladder. We decided to use a blue lighting gel to one of our background lights to add effect to the curtain background. This made the set look really nice and somewhat professional. I was operating the second camera out of three, while Emily Benham was on the first one and San Shannon was on the third. Each of us at different angles to cut from ones shot to the next. Craig Ellis, Joey Lever, and Andrew Miles were in charge of hooking these three camera to the vision mixer. Once on the screen we can look at all the shots together or just one at a time. If this was a real interview we would record it live and someone would be on the vision mixer cutting from shot to shot when applicable (Example: a single shot of Pete asking our interviewees a question then to a wide shot of all three of them responding to that question). 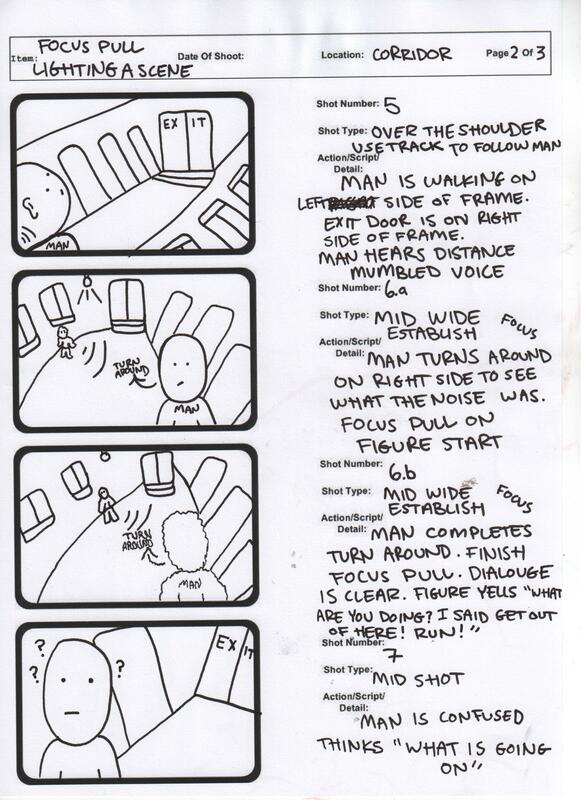 The whole point of this exercise was to get us used to the studio setup and more familiar with what it entails. I learnt a lot about the a studio setup and am more comfortable working in that environment. The last time I had any practice in a studio was at my high school in 2007. I was in charge of the vision mixer and operating cameras for our schools news programme. I was a bit rusty before this so this was great a great help getting me back in the swing of things. Exposure is a very essential and crucial part of the film industry. Correctly exposing the camera is very important and can determine the feel wanted for certain scenes and either make or break the shot being recored. What determines exposure? 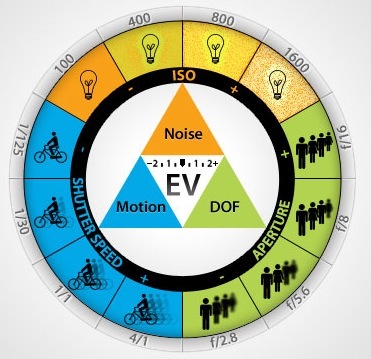 There are three changeable settings that control exposure, Aperture, Shutter Speed, and ISO. camera. Aperture is measured in F-Stops. The larger the number F-Stop, the smaller the amount of light is let though the lens. Example F/2 has a great deal of light whereas F/16 has such a tiny amount of light which is allowed in. These F-Stops personify different stops of light. capturing things at different rates of movement. If your shutter speed is faster than the movement of the thing you’re recording than your image will be outstandingly sharp. 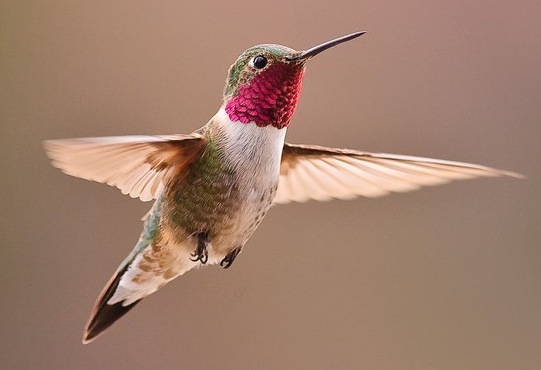 For example, if you’re filming a humming bird, take into account that its wings flap about 55 times a second. At the setting 1/30th the wings are unclear and indistinct but change the shutter speed setting to about 1/250th the wings are visible and crystal clear. light that comes into the camera. The higher the ISO, the harder the image sensor works to form a picture but with of cost of a grainy low quality image called “noise”. 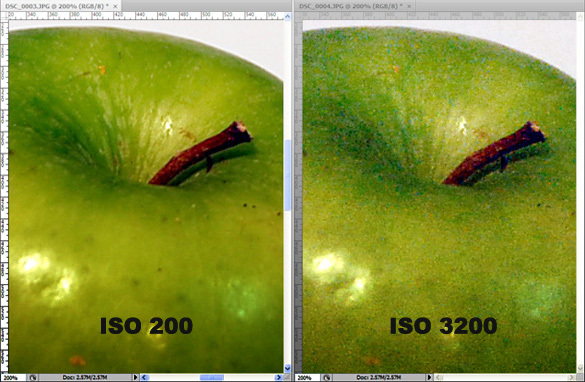 The lower the ISO, the less the image sensor has to work, creating a clean high quality crisp image. Main Parts of a Tripod: Head, Legs, and Spread. The Head uses the clip to hold in the camera. Always put the clip back into the head after using the tripod. 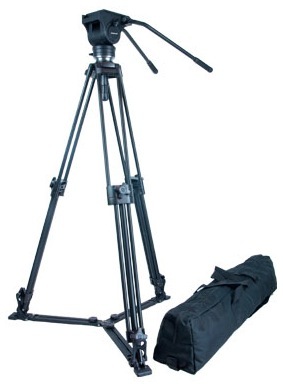 The head allows for a Pan and Tilt movement during filming or just a stabilized still shot. The drag control will allow you to adjust tension and lock down the specific angle desired. There are three legs that are adjustable and support the head. The Spread is what hold the legs together at the bottom. 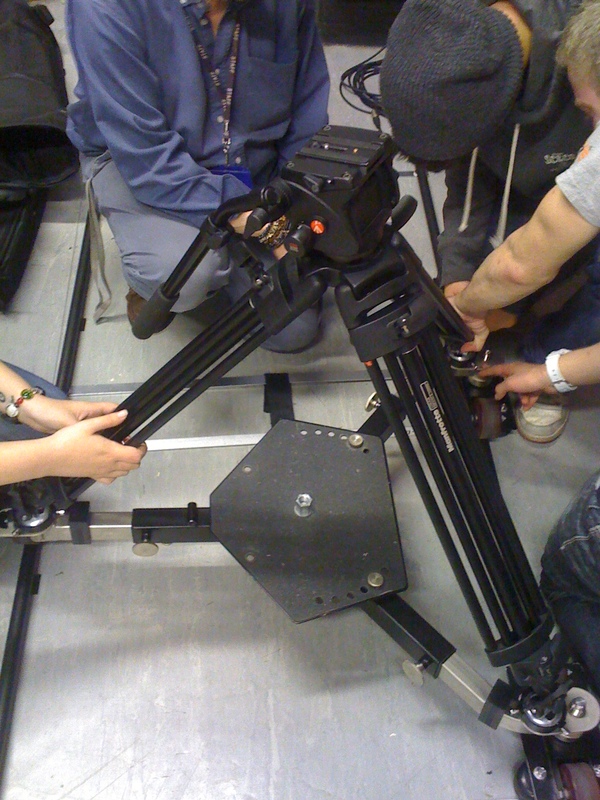 Tripods can have a wheel mount on the legs and do a dolly movement as well as attaching a track to achieve this camera movement. studio be sure someone is holding the ladder so it is stable and wont tip over. 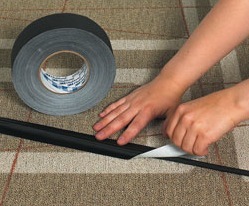 Watch out for exposed wires and always tape down loose cables to avoid tripping over and injuring yourself. 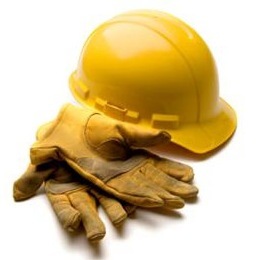 Although everyone is held liable for there own health and safety, ultimately it is up to the director to make sure everything is done properly. Amps= watts divided by volts. Example: A 1000 watt lamp divided by 250 volts (in England) equals 4 amps. About 3, 1000 watt lamps can be used on a single socket as wall sockets can handle up to 13 amps. 4 amps multiplied by 3 equals 12 and you wouldn’t want to risk another lamp as it would blow the socket. Be cautious of 3 phase power in big industrial buildings as some could have 2 or more phases, and if they do, stay away and do not touch both as you would risk getting an electric shock. Make sure there is always an escape plan if worse comes to worse and an electrical fire begins. windows, and a light at the far end of the corridor (left side) is flickering off and on every couple of seconds staying on for only for a moment. exit of the corridor. (Towards the camera). Focal pull as he get closer to the exit. is heading towards the exit. Cuts back to the establishing low long shot of the corridor. The man is still walking on the right side of the corridor; he is about half way to the exit (where the camera is positioned) the light in the background is still flickering on the left side of the screen but out of focus. The light is on then goes off, when it comes back on there is a blurry figure standing right underneath it. The man is unaware of this mysterious figure behind him and continues walking towards the exit. Over the shoulder track shot of the man walking on the left side of the frame with the exit door on the right side of frame in view. A distanced mumbled voice that incomprehensible makes the man slowly stop right before getting to the exit. Cuts back to the establishing long shot (only this isn’t on the mini tripod but a regular tripod to include the mans facial expressions). The man is in front of camera (right side of frame) staring just pass the camera ( he looks confused as well as a bit afraid). The blurry figure is still on the left side with the light still flickering on and off. He slowly turns (right) to face the blurry figure. As the man finishes turning around and is fully facing the figure the focus get pulled to reveal who the mysterious figure is. The distance mumbled voice is now clear and the now clear figure yells, “ What are you doing? I said get out of here! RUN! Cuts to a mid shot with the exit just over the right side of the mans shoulder. His facial expression shows he is less afraid but more confused. Cuts back to an over the shoulder shot of the man with the figure still in focus. 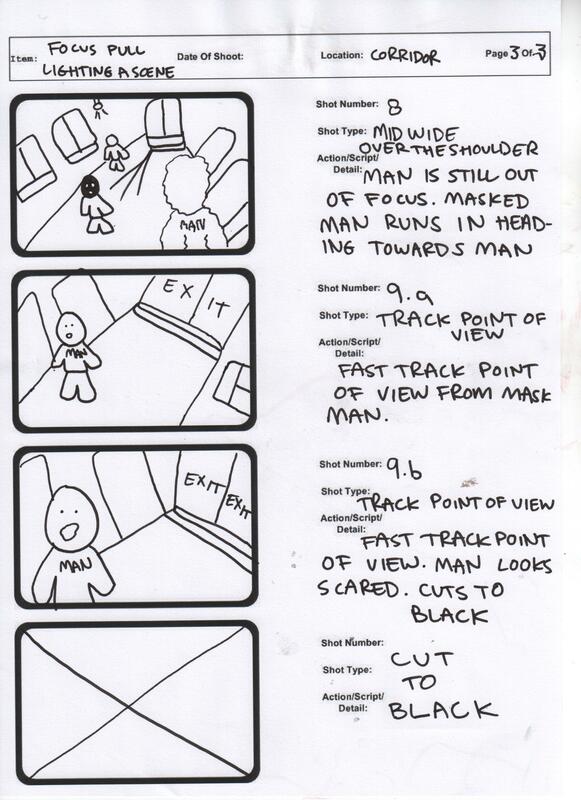 A masked man comes from around the corner by the figure and runs fast toward the man standing by the exit. Final shot is a fast point of view(of masked man) long track shot approaching the man. His facial expression is now frightened beyond all belief as the camera . The man screams as the camera is toward the end of the track. Then it cuts to black. 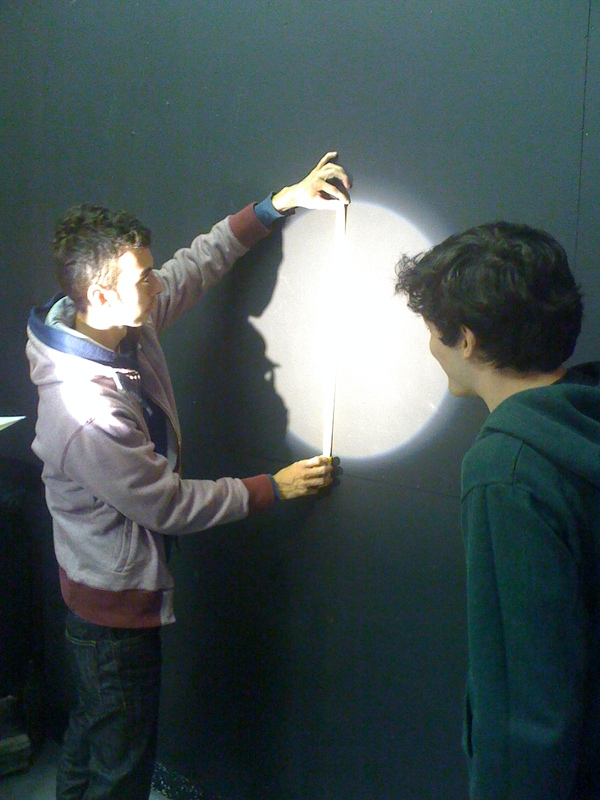 Here Bradley Thomas is measuring the light beam to see how much area the light rays expand and the intensity of them using the inverse square law. Light leaving a surface will radiate in all directions. This was an exercise for proper lighting when shooting interviews. Jordan Schofield was our mock interviewer. In this photo we were using three point lighting, which included a main light or key light, a fill light or soft light, and finally a backlight. 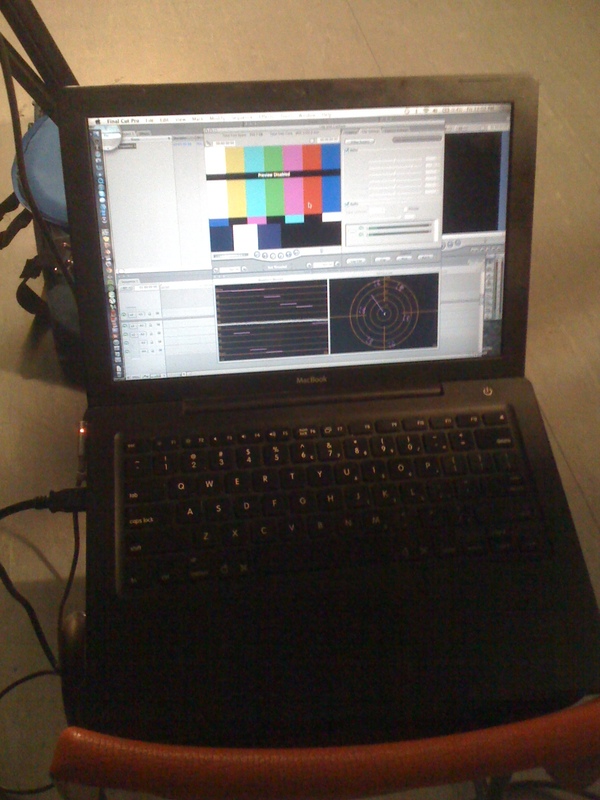 In this photo, I have the camera plugged into my computer and I’m using video scopes in final cut pro to display what the luminance level is, to see if is correct. We wanted to have it at 50% light intensity, and at first it wasn’t so we adjusted accordingly to have perfect dispersal of light. Here Pete Bendoris is standing on a ladder and adjusting the flood lighting for our green screen exercise. After we had set up our lighting and got our green screen up Tony demonstrates using the light meter and points the sensor towards the light rays to find ambient light. Here we tried a few contrasting aperture settings, then we tested different shutter speeds such as 1/50, 1/200, 1/500 ect.. we dropped and threw stones in a pile of flour using these different shutter speeds to see the differences between them. Here we’ve set up the dolly track and are correctly attaching the tripod to the dolly to film our scene. 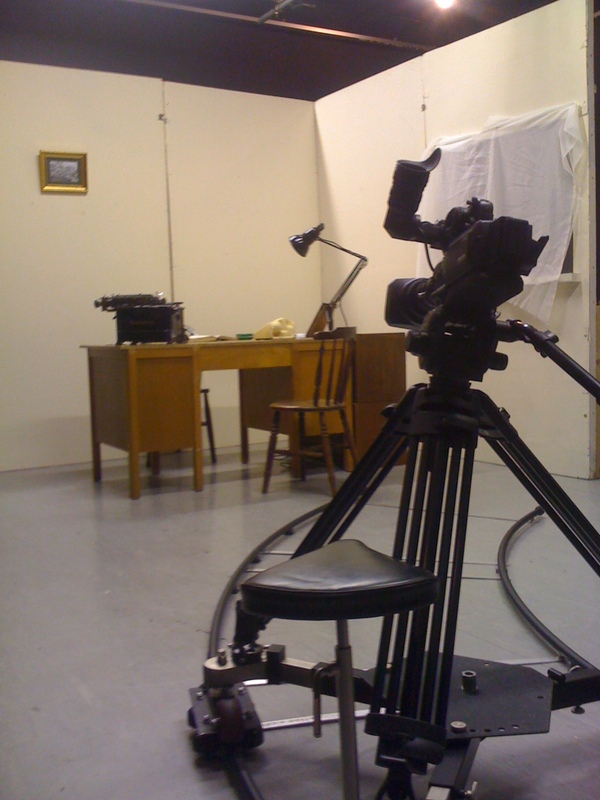 This is the dolly track all set up properly with the camera ready for filming. The set in the back ground is supposed to be a detectives office. 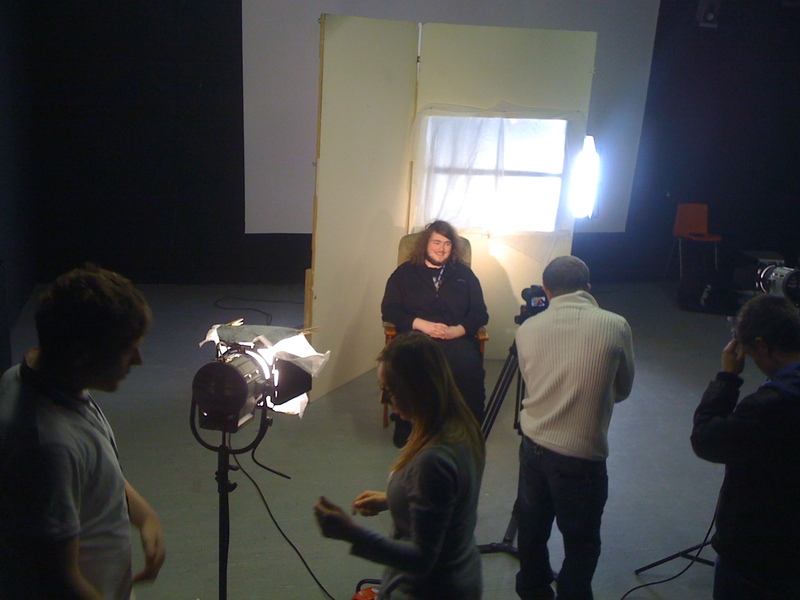 In this picture Jordan Schofield is using tree branches with our lighting to cast shadows on the background of our set. 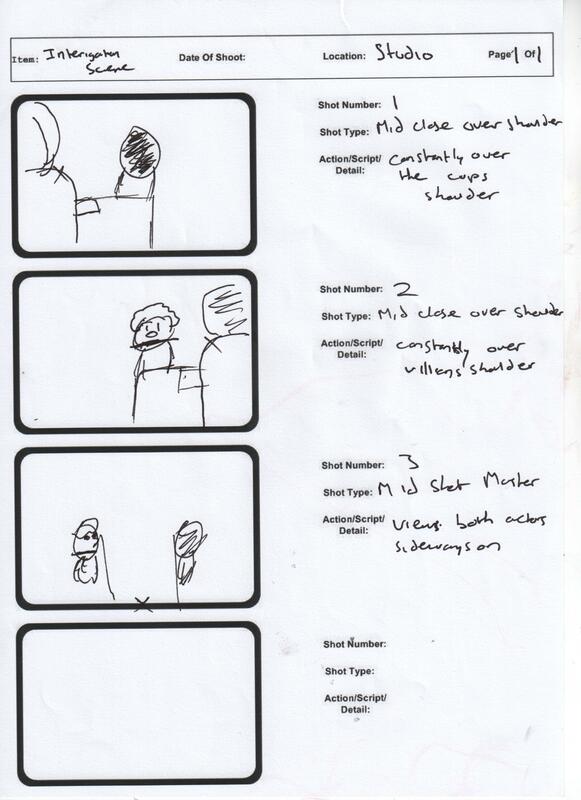 This will make the shot more realistic and believable. Here we are beginning to set up our 3 point lighting, making sure all lighting wires are taped to the ground, the tripod is secure, and establishing our opening shot for the drink awareness video.